Anyone who thinks love is all about candy and flowers has a thing or two to learn about healthy relationships, Dr. Elizabeth Valenti suggested on Valentine’s Day. In the “Tools for a Healthy Relationship” workshop she led during the second day of Mental Health Week at Grand Canyon University, Valenti said that boundaries, conflict-management skills and most important, self-love, are among the key ingredients in a robust partnership. 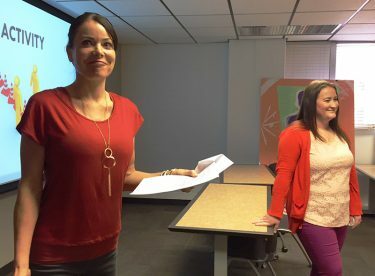 Psychology instructor Dr. Elizabeth Valenti (left) clearly enjoyed leading a workshop on healthy relationships during Mental Health Week. In one part of her session, she asked students to cross over “boundaries” symbolized by ropes on the floor. Valenti’s workshop is one of 16 that psychology faculty members are holding during CHSS’s first Mental Health Week, titled “Changing Perspectives: Filter Your Life for Positivity, Peace and Purpose.” Sessions end Thursday. You should always put love first. Love always will lift you up where you belong. While love is a part of all our lives, it doesn’t always bring peace and happiness. It can carry the price tag of pain. “If these are here, it could be a problem,” Valenti said. During one of several brainstorming sessions during the workshop, students listed other unhealthy side effects such as lack of trust, abuse in all its forms, jealousy, manipulation and feeling down. Boundary setting is essential in relationships, yet many back away from sticking up for themselves, Valenti said, because they lack self-love and don’t even know their boundaries. 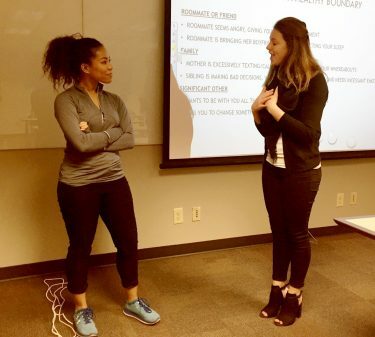 When a friend consistently texts you at 3 a.m.
During a “Tools for a Healthy Relationship” workshop, Cierra McDonald (left) and Sarah Jacobson, both sophomores, display successful conflict resolution. “How do these feel in your gut?” Valenti asked. For some people, it is easier to be uncomfortable than to risk a conflict. Others fear being ridiculed, rejected or abandoned. If you can’t say no without feeling guilty, can’t talk about your feelings without apologizing and feel as though you are always walking on eggshells, chances are you need to set boundaries, she said. Sophomores Cierra McDonald and Sarah Jacobson showed the class how to set a boundary and resolve a conflict. The hypothetical issue involved a roommate inviting her boyfriend over every night. The roommate who was getting awakened told the other how she felt about the unexpected disruptions. The roommate with a boyfriend said she didn’t know her friend felt that way and from then on would ask her if it was OK before inviting her boyfriend over. Valenti, who described herself as a “recovering people pleaser,” said that establishing parameters provides physical and emotional space and eliminates fear and confusion.